Do I stop? Do I slow down? Do I just not realize at all that I'm headed for impending doom by crossing into an intersection without traffic control? How long will it take before some genious invents some kind of redundency system for traffic lights, especially considering LEDs consume very little energy. 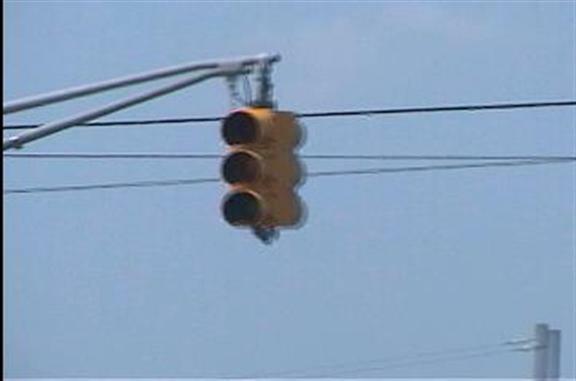 If the power failed, and the traffic controller switched over to battery power, using one signal head per direction, 50% light intensity, and a blinking-red/blinking-yellow mode, then considering an LED signal will consume about 6W typically and then 25% of that in its reduced duty cycle, the whole intersection would only consume 6W (plus the power to control the controller itself). My laptop battery currently holds 30Wh of charge, enough to run a reduced power intersection for 5 hours according to this configuration during a power failure. Makes you wonder why we don't invest that little extra bit of capital to keep our traffic flowing safely during a power failure or other emergency.